Weddings favors and wedding gifting have always been a part of wedding celebrations. Whether you’re from the groom’s side or the bride’s side, you’ll end up planning for some sort of give away for your close friends and family members. It’s always a wonderful idea to work in a little customized something for your guests to remember your wedding by. After all, they made time to come and be part of your special day. Traditional Indian wedding gifts have come a long way from the traditional mithai and dry fruit dabbas that are handed over to guests when they depart. Customization and personalization is now a key factor in selecting give aways for your wedding guests. The theme of your wedding and the budget are other factors to keep in mind while picking something out for your wedding party. Give aways have become a part of every function or ceremony. 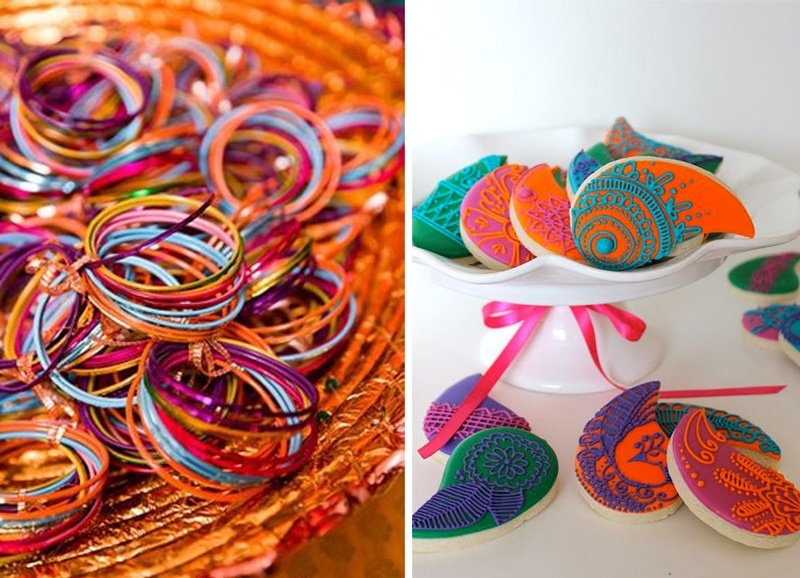 So if your friends are planning on a bridal shower, you might want to plan a small token give away for them, Mehendi is another ceremony where fun girly gifting ideas are being incorporated. To help you explore and expand your horizons a little more, these 10 unique Indian wedding gifting ideas will add a touch of pizazz to your wedding and make your guests super happy. And remember, packaging is the key! Not matter what you gift your guests as a token of appreciation; the packaging is what will move this up a few notches. So have a look at these Indian wedding gift ideas for guests and choose your pick. One of the most elegant and personalized favors of all time, bath salts in test tubes is being well received by guests. Why not? These crystalline substance work great to create a soft-scented ambiance for your bath time. Who doesn’t love a long and refreshing bath time? Not to mention how pretty they look. You can also stuff in special flavoured tea leaves, giving your guests a change in taste from the usual Indian chai they have. This is one of the best gift ideas for wedding guests at a Indian Wedding as chai pe charcha always wins over coffee conversations! Here’s a little something for all those little munchkins who are were part of your wedding. These special tiny guests deserve a favor too, right? Mason jars are the latest trend in gift packaging and presentation. Be it décor or personalized party favors, they seem to have found their comfortable spot in wedding celebrations too. Fill it up with goodies. Think – homemade cake, pickles, marmalades, jam, M&Ms or gems, nuts, popcorn seeds, dried fruit or anything exotic. The list can go as far as your imagination. Mehndi and bridal showers or bachelorette parties are all about girls having bucket loads of fun. To show how much you love your girls, there is no better way than giving away cool and useful party favors. Colourful Bangles – Always a Hit! For totally geeked-out couples, a personalized USB comes as close as a unique wedding favor you can give to your guests. If you don’t mind putting in a little effort, store some of your favourite songs or a wedding movie perhaps, that your guests can enjoy. Having an unusual wedding theme? Let your guests take away a reminder of the fantastic party you threw to celebrate your union. Say, if you’re hosting a vineyard wedding, then personalized wine cork key chains make a great wedding favor. If having a Bollywood themed wedding, then movie souvenirs. To keep the elders of the family happy, you can stick to traditional Indian wedding favors too. These can be given out to close friends and relatives. Think – silver or jewelled stoned mini boxes, filled with dry fruits or traditional mithai. If budget is not a constraint, then silver coins in these boxes could be well-received by your guests too. Find more ideas on theme based wedding gifting here. If considering buying online, check out what Indian wedding gifting options do we have in our Weddingz Shop.